The extent of the evidence is that government schooling generally can’t handle controversy, but that is almost never even mentioned in the seemingly endless war between creationists and evolutionists. And the same is true for the aspiring Miss USAs. While a few appeared to conclude that the nation is too diverse for public schools to deal with this topic—see Miss Kentucky at the 5:07 mark, and Miss Utah at 12:36—the majority made no mention of the problem. Reading Neal’s insightful post brought me back to a subject that I promised him a few months ago I would treat when I had the chance. Neal and I agree that a government school monopoly can’t handle controversial issues and harms the national culture by undermining pluralism – real pluralism, not the phony kind you get by indoctrinating everyone’s children in a uniform (and politicized) ideology of what pluralism means. Here’s where I think Greg is incorrect: Choice is not an argument for another day. It is the argument for this day. Until all parents have real, full choice they will have no option but to demand that higher levels of government force intractable lower levels to provide good education. It won’t work — thanks to concentrated benefits and diffuse costs all levels of government are dominated by teachers’ unions and administrators’ associations that will never let tough accountability and high standards rein – but it is all that parents can do absent the ability to take their children, and tax dollars, somewhere else. That means choice is essential right now, because it is the only way to take power away from special-interest dominated government and give it to the people the schools are supposed to serve. In other words, it is the only option that will actually work, obliterating the special-interest hammerlock, imposing accountability to customers, and when coupled with freedom for educators unleashing competition, specialization, innovation, and constant upward pressure on standards. In other words, it will do all those things that national standardizers emptily and illogically promise that their reform will do, and much, much more. I promised him a response and never got around to it. This looks like the time. Time is actually the basis of my response. I’m more or less with Neal on all the substance here. But getting the reforms we want requires us to participate in a social process that takes place within institutions and relationships, and which therefore has to unfold over time. Map out the entire architecture of how the reform looks across all issues, institutions and areas. Distill this architecture into a single integrated blueprint that fits everything together. Fight to implement your blueprint. Treat anyone who doesn’t subscribe to your blueprint as an opponent. This reflects, I think, too much emphasis on the cognitive – as though there were a Platonic Form of Education Policy and our job is to contemplate it until we grasp its unchanging eternal nature, then subdue the world of time and change until it matches the eternal unchanging Form. In this Platonic dualism, the changeless and eternal (in this case, the perfect education policy blueprint) is the only thing we value for its own sake, and the world of time and change is valued only as raw material for constructing tangible manifestations of the intangible Forms. Neal’s insistence that all issues must be settled right now reminds me of a scene from C.S. Lewis’s The Great Divorce, which is a book that really reflects the Platonic view (especially as channeled through Augustine, who took Plato mainstream). In the book, Lewis describes a dream in which he sees people’s entire lives distilled down to a single moment of choice between good and evil. In one scene, a Bright Spirit offers a man eternal bliss if he will turn away from his evil desires. He keeps making excuses. The Bright Spirit offers to kill his evil desires and he says: “There’s time to discuss that later.” The Bright Spirit replies: “There is no time.” A little later he says, “Some other day, perhaps” and the Bright Spirit replies: “There is no other day. All days are present now.” He demurrs but offers to return later: “I’ll come again the first moment I can.” The Bright Spirit replies: “This moment contains all moments.” This is essentially the Platonic/Augustinian approach to life, death and the afterlife – your life “down below” in the world of time and change was really just the ephemeral expression of a single, trans-temporal choice between good and evil. This view feels transcendent and liberating to people who have a certain highly cognitive bent of mind, but it’s actually reductive and limiting. Neal’s insistence that we can’t talk about national standards without also talking about school choice feels the same way. We’ll never make progress on any issues if we can’t discuss one issue without simultaneously discussing all the others. Or, to put it another way, we can’t win any battles if we think that they’re all really the same eternal trans-temporal battle, with little manifestations of it fought over and over again within time. Because that way of thinking forces you to isolate yourself from potential allies who may not be interested in your entire blueprint (ahem) but who may be useful coalition partners. 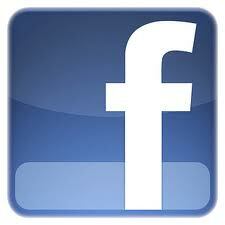 This entry was posted on Tuesday, June 21st, 2011 at 9:53 am and is filed under civic values. You can follow any responses to this entry through the RSS 2.0 feed. You can leave a response, or trackback from your own site. I must confess that as a university student I dismissed the Republic utter nonsense between the shadows on caves and utopian elitist garbage. This was undoubtedly rash, but I was 19 at the time and had it all figured out. This leaves me ill-equipped to follow the logic of this post, but I think I agree anyway! If supporting the idea that the best scientific theories (supported by consensus of scientists based on evidence) should be taught in science classes of public schools makes me an elitist, then please count me in. Those who think God planted fossil evidence as some sort of misdirection (perhaps as test of faith) should be counted in with the Islamic fundamentalist countries (no such constitutional constraints) who share the idea of teaching ancient religious stories as science. It is disturbing that 96% of the pageant contestants could not provide a clear affirmative answer to the question. Fortunately, the winner was in the other 4%. The song, “Hail to the Chief”, has been used to honor our presidents for nearly 200 years. It is unfortunate that a reasonable display of respect by a public school to the President of the United States of America is presented in such a negative way in the original post. I think such a show of respect is appropriate for any president regardless of ideology or party. 1. The phrase “all hail,” particularly when publicly proclaimed by a government institution, has other connotations that are not conveyed by the dry abstraction of a dictionary definition. 2. I don’t feel highly confident that this school posted “All Hail President George W. Bush” in 2000 and 2004, or that it would post a similar message in 2012 should the Republican win. How confident are you? 3. Given the fragmentation and distrust in the culture, even if this school means this kind of thing well, it can’t help but come across as sinister to those who don’t share your robust faith in their good intentions. Should schools work to actively alienate people who don’t feel like the government monopoly school system represents them? Or should they be more sensitive to distrust and maybe dial down the cultural triumphalism a little? 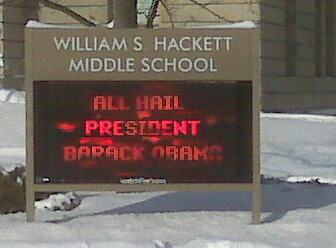 I do not know whether the Hackett middle school has posted other positive signs supporting past presidents, but I have seen numerous schools welcome numerous presidents in various ways including raucous cheering for presidential visits. I do not consider such generally patriotic displays as “work to actively alienate” anyone. Last, I do not see a compelling need for schools to be more sensitive to those who distrust the government. My last three sentences are not intended to dismiss all arguments that government office holders may be overreaching or wrong on policy issues. Instead, I am supporting respectful displays toward American leaders including our current president. Please substitute “enthusiastic” for “raucous” as the adjective before “cheering” in the comment above. I think it is important to make the students aware of these ideas or disciplines at school. However, it is more important to teach your kids your point of view at home. Then when your kids are faced with an opposing controversy they are prepared to sort through it all. If it isn’t your teacher who will introduce them to the opposing view, it will be a friend or a peer. Might as well prepare them to handle the controversy instead of being afraid they might accept an opposing view point.